84356 • Tamiya XB Ferrari F2012 • F104 • (Radio Controlled Model Archive) • RCScrapyard. Released by Tamiya on September 21, 2013, the XB Ferrari F2012 (#84356) is No.856 in the Expert Build, Limited Sale Series, based on the F104 Chassis. 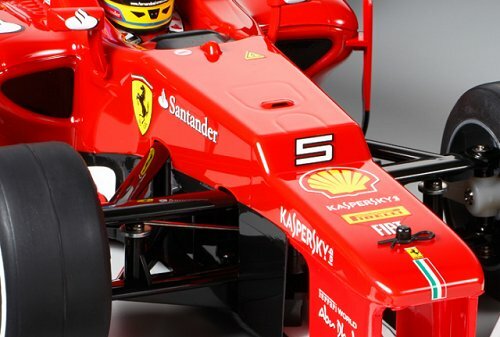 The Tamiya Ferrari F2012 kit (#58559) was introduced in February 2013. 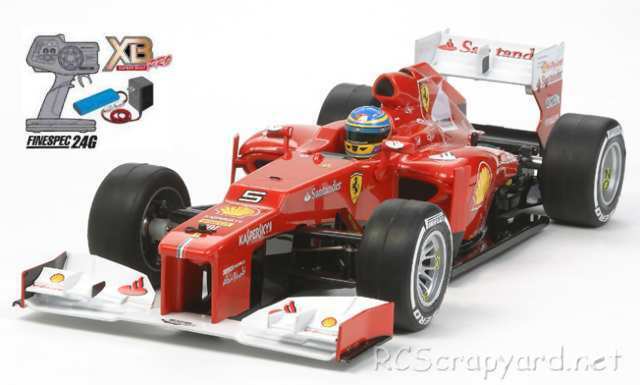 The model is of the Ferrari F2012 that was driven by Fernando Alonso and Felipe Massa in the F1 World Championships. A pre-painted lexan bodyshell, a 540 motor and radio system are included, but may require a battery, charger and speed controller to complete (specifications differ from country to country). The twin deck FRP (Fibreglass Reinforced Plastic) chassis design of the F104 provides a more rigid structure than its 2WD predecessors and a radically re-designed front end allows for the setting of two different camber angles. The smooth action pressure plate ball differential remains along with the steel axle shaft. The best part of this re-design for me is the re-positioning of the battery to a longitudinal position, vastly improving the centre of gravity and reducing body roll.